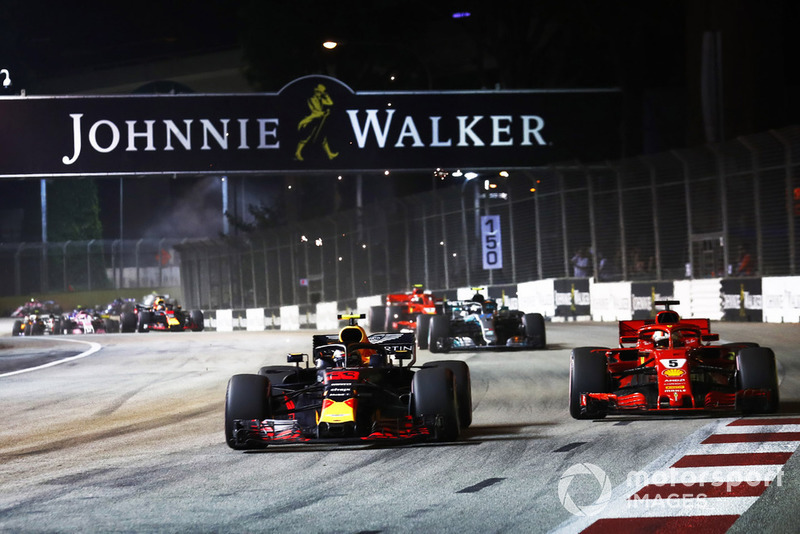 James Allen analyses the Singapore Grand Prix, which was a potentially decisive race weekend in the championship battle between Lewis Hamilton and Sebastian Vettel. 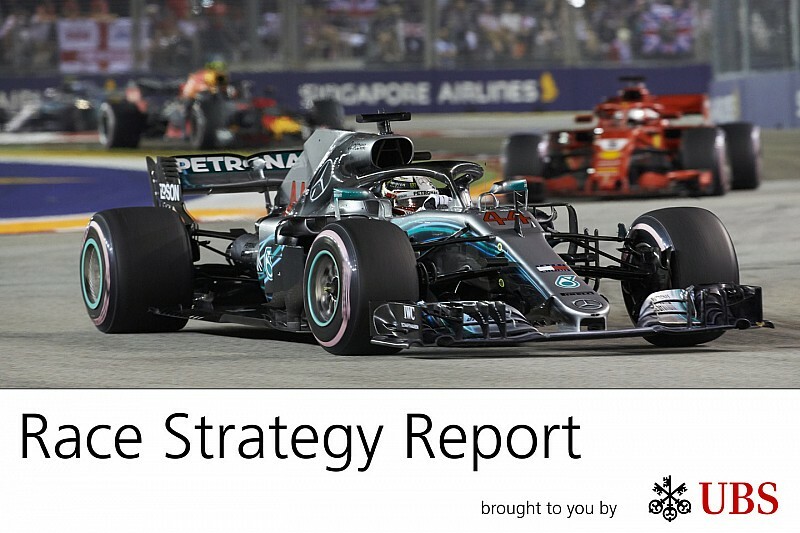 Another race – along with Germany, Hungary and Italy – that should have been won by Ferrari slipped away through a combination of driver and strategy; the balance heavily slanted here towards Hamilton and Mercedes. Often in Formula 1 race strategy, it’s all about the gaps between cars and ability to put your car back out into clear air. 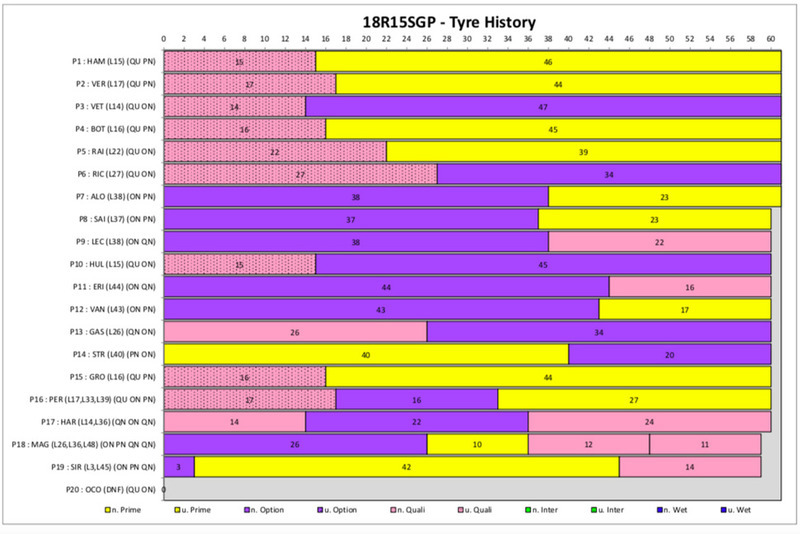 On many circuits with the combination of tyres brought by Pirelli, this sorts itself out relatively simply as the faster cars pull away from the midfield and large gaps open up for them to pit into, thus not losing too much time when they rejoin. It’s the biggest advantage top teams have in this so-called two-tier F1, where the top three teams are so superior on pace to the midfield. It makes their life so much easier on race strategy 90% of the time. 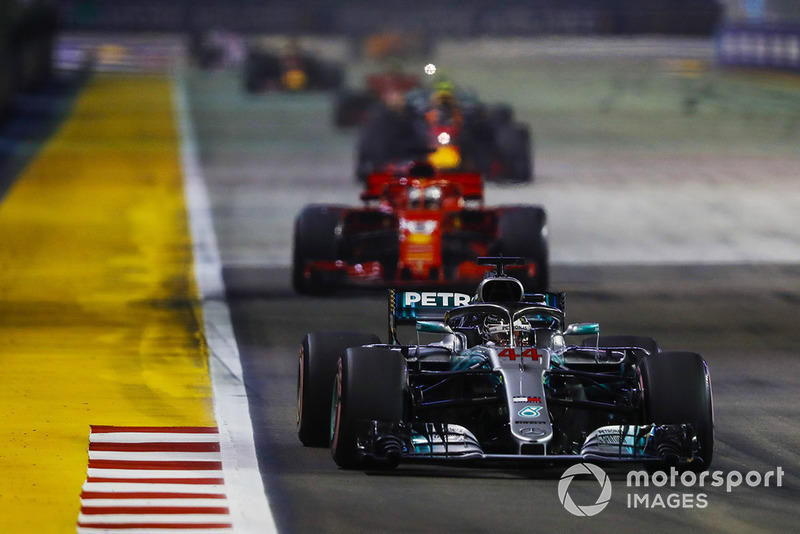 But on street tracks, sometimes finding the gaps is not so easy and the story of the 2018 Singapore Grand Prix was the way the teams worked the concertina effect created by race leader Lewis Hamilton. He had the prerogative to control the race as he saw fit; nursing his first set of tyres, the hypersofts, at over 10 seconds a lap off qualifying pace before suddenly speeding up on Lap 12 to cover off the undercut. We’ve seen this before in Monaco, a famous Nico Rosberg/Hamilton encounter in 2013 springs to mind. 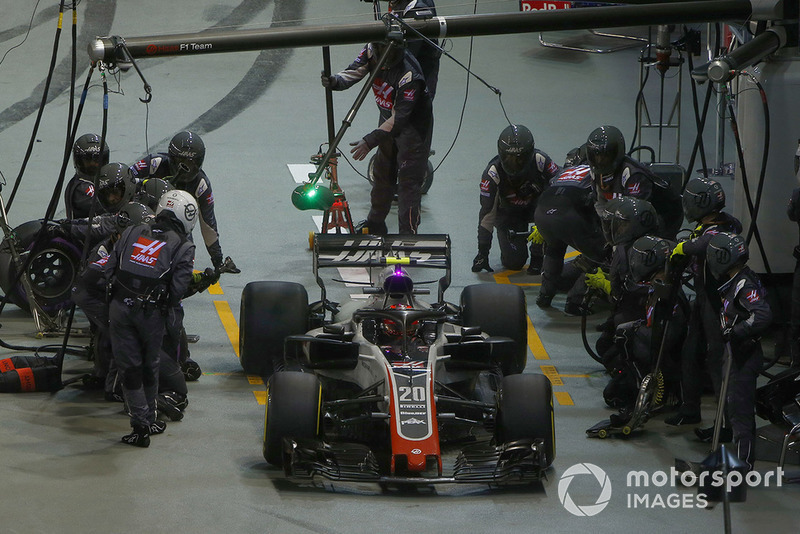 But in Singapore it was the desire to make the race a one-stop that necessitated getting the hypersofts to last to around Lap 15 or 16, where a switch to softs would take you to the end. Everyone knew this as they sat in the train behind Hamilton. To undercut you need to be within around three seconds of the car in front. This depends, however, on what tyre you switch on to. 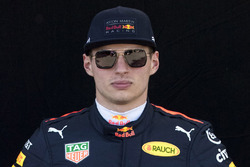 So, having initially trailed Max Verstappen but passed him milliseconds before the Safety Car was deployed for the accident involving Esteban Ocon – the second time recently that Vettel has squeaked in a move under the wire as the Race Director was reaching for the “Deploy Safety Car” button – Vettel was in position to consider a strategy attack on Hamilton. 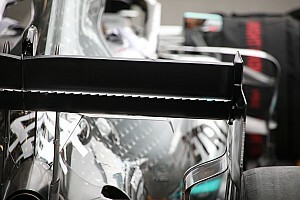 Hamilton was playing with the concertina, lapping in the high 1m47s until Lap 11, when he suddenly bolted and pulled a gap of 2.2 seconds on Vettel over two laps. 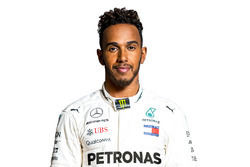 On tyres that had not suffered from following another car, Hamilton had more pace, so Ferrari had to act even though they did not have the gap they required back to Sergio Perez in the Force India. 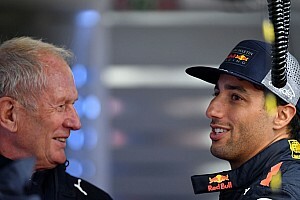 There was a nice five second gap between Ricciardo and Perez – and growing fast – but Ferrari knew that they had to try to bring Vettel in and fit the ultrasoft to attack Perez in the hope its driver could get the job done quickly enough that when Hamilton reacted on the next lap and pitted, he would come out behind Vettel. Pitting a lap or two earlier and fitting the soft would not have won the game. 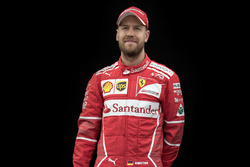 This was a high-risk strategy for Ferrari because if Vettel was not able to pass Perez, who was in a pugnacious mood that night, having hit his team mate at the start and later slammed into Sergey Sirotkin, then he risked losing second place to Verstappen. This is exactly what happened as Perez held up Vettel for two laps, costing him a further three championship points. 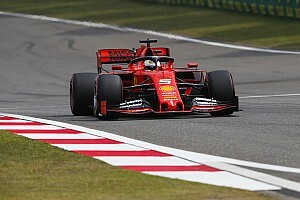 On top of that, Ferrari were committed to a tyre where the gamble on faster warm up on the out-lap had to pay off, otherwise the risk of the tyre performance drop-off later in the race would outweigh the upside. 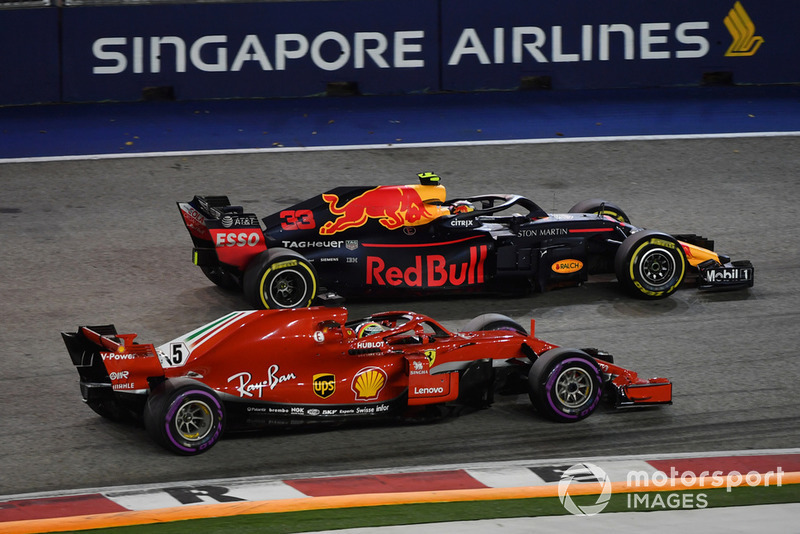 It is easy in hindsight to criticise Ferrari’s strategy in Singapore, but on the pitwall you have to make a decision in the heat of the moment; they had few other options, as they could feel their grip on the world championship slipping away. 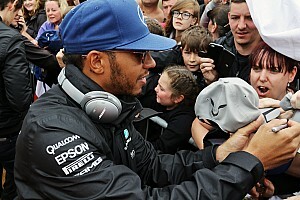 The longer it had gone on, Hamilton would have pitted without challenge, and the chance to undercut would have gone. Stay out too long, and Vettel risked being undercut by Verstappen anyway. The danger for Maranello is the damage to morale of losing a championship every single team member knows they should have won, having done such a wonderful job in the last year to turn the team around and build a dominant car. It would lead to questions about the driver, the leadership and much else besides. Hence the willingness to take a risk to try to make something happen in Singapore. 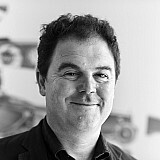 A little further back in the field was a driver who left Maranello in 2014, having lost belief that they could perform the technical turnaround that they have subsequently done. Fernando Alonso got the maximum out of his car using the reverse strategy that he was given by the McLaren team, starting on the more durable ultrasoft tyre. He was able to take advantage of the concertina and the fact that the midfield cars that qualified in the top 10 ahead of him were all on hypersofts, and had to stop early into traffic. Behind him, his fellow Spaniard Carlos Sainz did the same thing and followed his mentor. 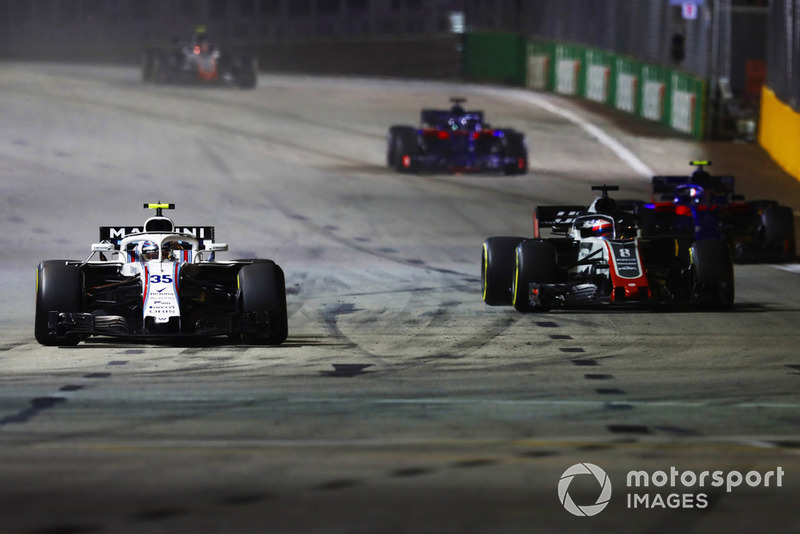 It meant that the faster-qualifying likes of Perez and Romain Grosjean got stuck behind the Williams of Sirotkin, who had stopped on Lap 3 under the Safety Car to remove a stray part from Ocon’s wheel that was lodged in his front wing. 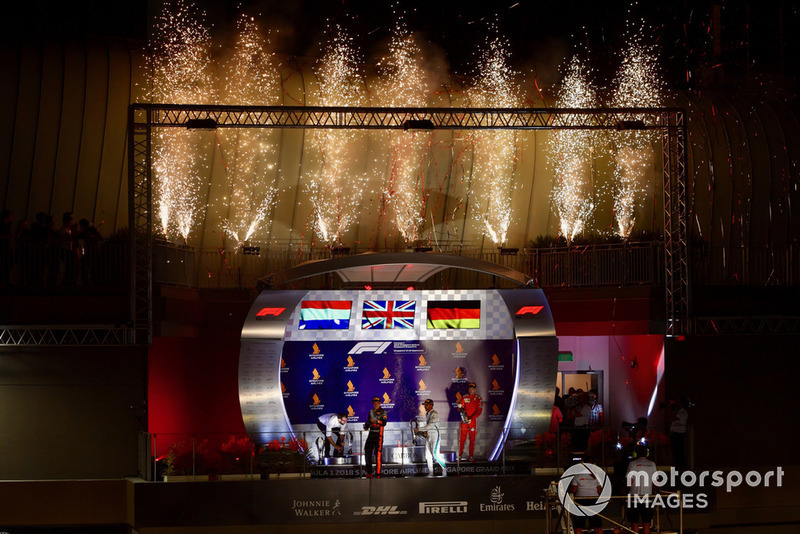 The stubborn Sirotkin held them up significantly and it opened up a nice gap for Alonso and Sainz to pit into, yielding seventh and eight places. Charles Leclerc was another beneficiary of this strategy in the Sauber, although he had to pull off an overtaking move on the Toro Rosso of Pierre Gasly, to get into position to benefit. He pitted on the same lap as Alonso, Lap 38, and picked up a very handy ninth place – his sixth points scoring race from 15 starts in F1. 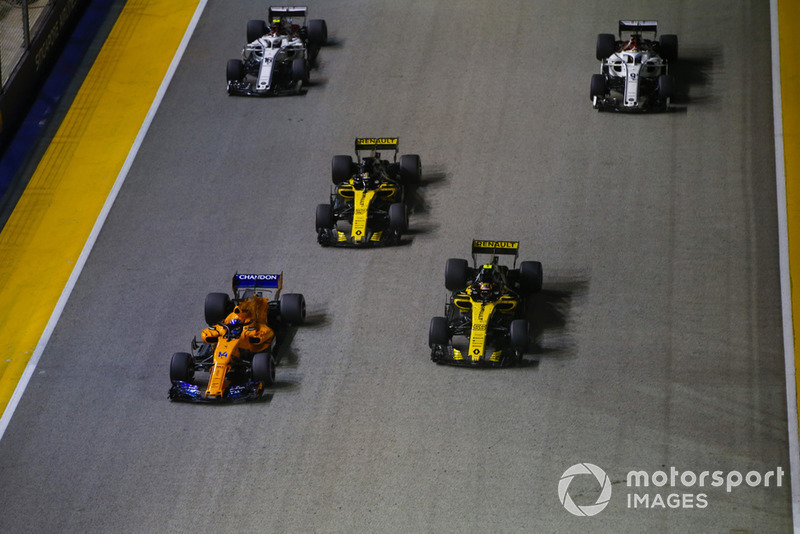 A couple of other interesting details: Magnussen was on the right tyre but did not do what Alonso, Sainz and Leclerc did, and instead he pitted early from ultrasoft tyres behind the train – which shows that they had modelled the race very differently to the other three teams (and on this occasion incorrectly). Meanwhile, Toro Rosso chose to start both cars on hypersoft, which suggests that they also modelled the race incorrectly as they believed it would be an aggressive undercut race and/or they could extend longer on the hyper. 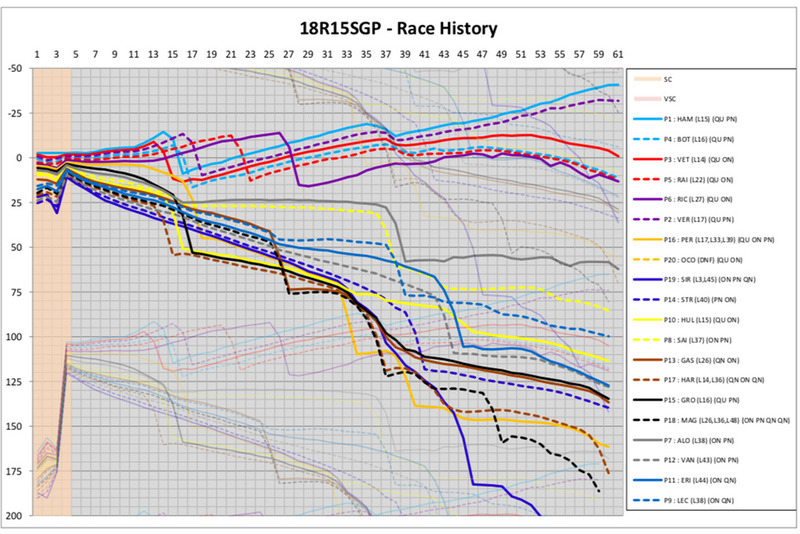 As most teams outside the top 10 believed that this race was quite obviously one to start on ultrasoft, it is strange they committed to hypersoft with both cars. It certainly didn’t pay off.